Mixing consoles, tape reverberators etc. Hammond tonewheel Organ Samples. (both have been recorded on CD using professional recording and test equipment. Video tapes, 8mm and 16mm films. Equipment recently repaired, serviced, modified or redesigned. This includes professional RF telecommunication equipment, HAM radio equipment etc. 'Nakamichi' and the Nakamichi logo are registered trademarks of Nakamichi Corp. Japan. 'Dolby' and the double-D symbol are registered trademarks of Dolby Laboratories. 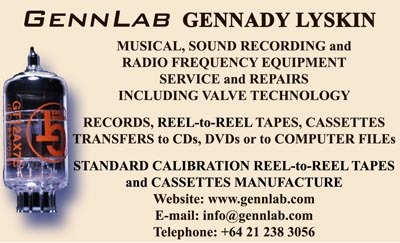 The GennLab website is maintained and created by Gennady Lyskin. *Please note all prices are in $US. Your order can not be processed until payment has been made for shipping. Follow the shipping payment instructions on the order pages.